Growing apple trees in Kansas can be a challenge, so variety selection is important. Kansas is known for volatile weather. Late spring frosts can damage blooms, resulting in a fruitless season. Early fall frosts can damage late-season fruit on trees. If space is not limited, planting both early and mid-season blooming varieties may be an option. Jonagold, Gala, Empire, Golden Delicious and Red Delicious apple trees are all recommended varieties for Kansas, according to Kansas State University Research and Extension. Apple trees are most productive when cross-pollinated with other apple trees. 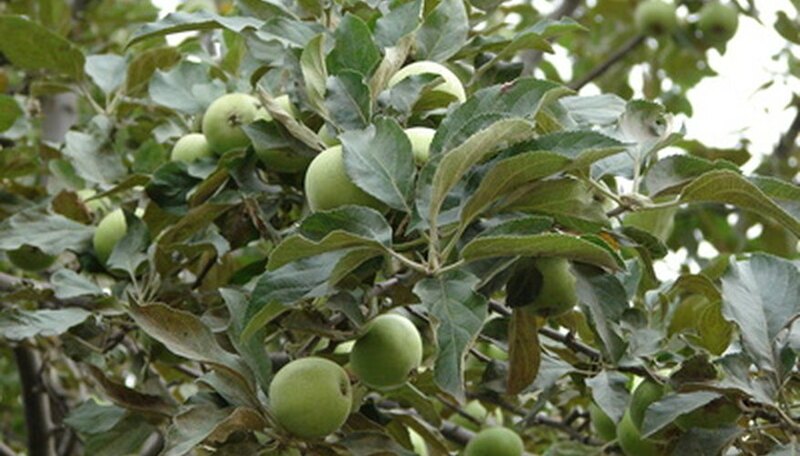 The Jonagold apple tree is a sturdy and vigorous tree to grow in Kansas. The Jonagold apple is a large yellow apple that is striped with light red. They are slightly tart and can be eaten fresh or cooked for use in desserts. The tree blooms in mid-season, with fruit ready for harvest in mid-September to late October. The Jonagold apple is a good storage apple and will last up to three months in the refrigerator. Gala and Empire apple trees are good pollinators for the Jonagold apple tree. Gala is also known as Royal Gala. The Gala apple tree is a compact, prolific producer but it needs heavy thinning for yearly bearing, reports Allaboutapples.com. The Gala apple is round with a mixture of yellow, orange and red skin. They are eaten fresh and have a semi-sweet to slightly tart flavor. The Gala apple tree blooms in early to mid-season in Kansas, with fruit ready for harvest in October. The Golden Delicious apple tree is a good pollinator for the Gala apple tree. The Empire apple tree is an upright vigorous tree that produces yearly, according to Allaboutapples.com. The Empire apple is dark red with a green background. It is slightly acidic or sharp in taste and can be eaten fresh, used for cider or in cooking. The Empire apple tree blooms early in the season, and is ready for harvest in September. Golden Delicious, Red Delicious and Gala are all good cross-pollinators for the Empire apple tree. The Golden Delicious apple tree is somewhat vigorous and will bear fruit annually if thinned frequently. It bears yellow-green fruit that is mildly sweet in flavor. The fruit cam be eaten fresh or used in cooking. Although the Golden Delicious apple tree is self-fertile and will produce fruit without cross-pollination, a more bountiful crop can be achieved if crossed with another apple tree. Recommended pollinators are Empire, Gala and Red Delicious apple trees. The Red Delicious apple is a sweet-flavored apple with a deep red skin that is eaten fresh. The tree blooms early in the season and the apples are ready for harvest in late September. Cross-pollinators for the Red Delicious apple tree are Golden Delicious and Gala apple trees. K-State Research and Extension: What Fruit Trees to Plant?